To determine if the ‘Ask A…’ Series workshops are having a measurable impact, or “moving the needle,” with respect to variables such as understanding and empathy. Six separate workshops were held, each focusing on a different group (Muslims, Trump supporters, newcomers, immigrants, police, transgender people). Different participants were involved in each workshop. Participants were solicited via radio and web advertisements. Participants fell into one of two categories: Askers or Answerers. Askers brought their own questions to the workshop; the Answerers addressed these questions, providing their own unique perspectives. All participants were asked to complete three separate surveys with respect to their workshop: 1. Before the workshop (pre-survey); 2. Immediately after the workshop (post-survey); and 3. Three months after the workshop (3 months post-survey). The purpose of this approach was to determine if participants experienced any changes in understanding, empathy, etc. with respect to the Answerer group as a result of the workshop. We also wanted to know if these changes persisted over time – hence, the three months post-survey. There were statistically significant increases in Asker’s knowledge concerning the group, as a result of the workshops. In addition, these reported knowledge scores remained higher than the original pre-survey at the 3-month mark, demonstrating that these changes are lasting. When averaged together, the workshops produced a 1.4-point increase in Asker knowledge from pre- to immediate post-workshop survey (on a scale ranging from 1 to 7). Current results are presented below in Figure 1. (note: final numbers for Ask a Newcomer will not be available until late February). Similarly, we found statistically significant increases in Asker’s empathy for the group after the workshop, as well as three months later (for the groups we have data for). Averaged together, participants experienced a 0.9-point increase in empathy from pre- to immediate post-workshop surveys. 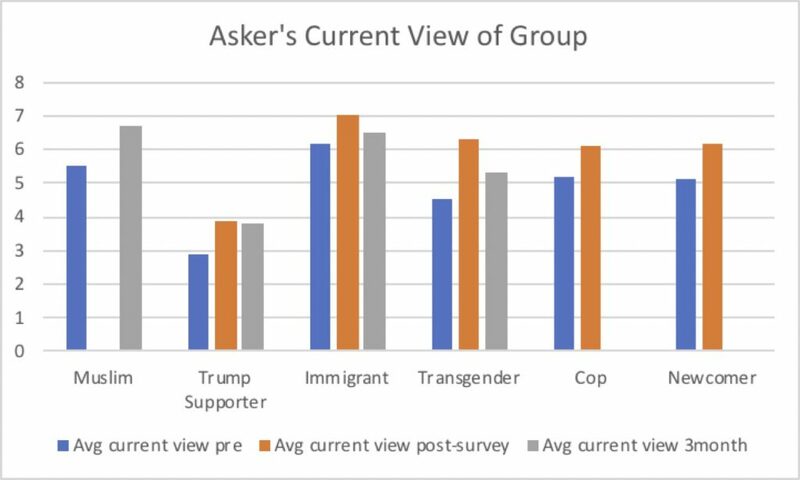 Asker’s current view of the group also increased by statistically significant margins. After six workshops, askers experienced an average increase of 1.1-points from pre- to immediate post-workshop surveys. These increases also appear to last over time. In total, with the current data and across all workshops, Askers’ reported knowledge of the Answerer group was up by an average of 1.1, current view was up by an average of 1.1, and empathy was by up an average of 0.7, three months after each workshop. We thought it might be interesting to determine which Asker group’s impression of their Answerers had changed the most, from before to immediately after the workshop. 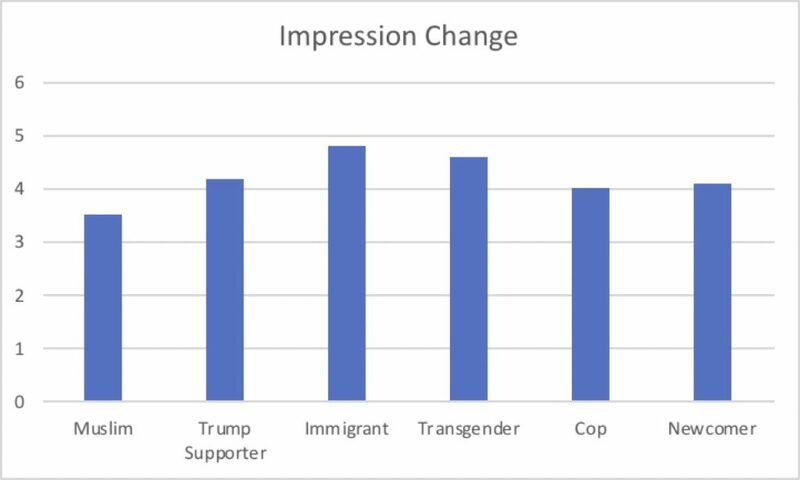 It turns out that the Ask An Immigrant Askers’ impressions changed the most. The group whose impression changed the least was Ask A Cop. Similarly, we were interested in learning which Asker groups were most surprised by what they learned in the workshop. Again, the Ask An Immigrant participants scored highest on this measure. 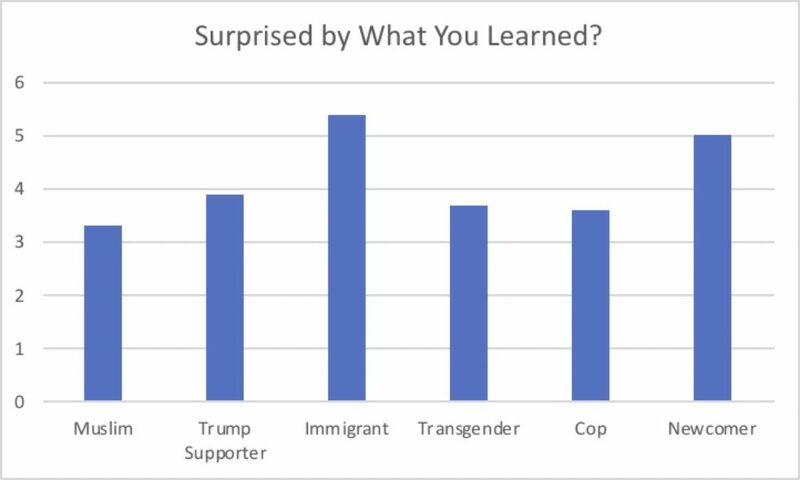 The Ask A Muslim participants scored lowest, being the least surprised by what they learned. There were statistically significant changes in understanding as a result of the workshops. Relevant data is presented below in Figure 6. For reference, a “1” indicates no change in understanding, while a “7” indicates a great deal of change in understanding. Askers felt the least nervous going into the Ask A Newcomer and Ask An Immigrant workshops, and most nervous going into the Ask A Transgender Person workshop. Though the data from other workshops is presented here, those three were the only ones that were statistically significant. 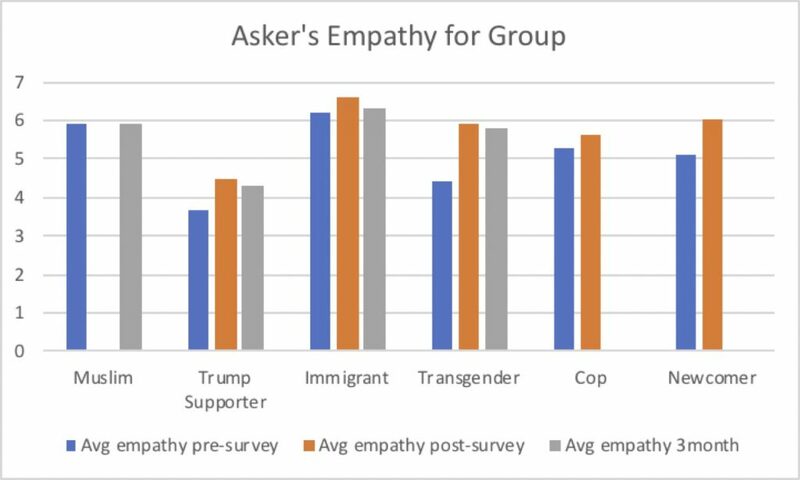 We found that an Asker’s current view of the group before the event correlated strongly with their levels of empathy towards that group, in both pre- (strong correlation: .669) and post-surveys (strong correlation: .717). This makes sense, given that individuals are more likely to feel empathy for people they view in a positive light. Similarly, if Askers felt that they knew a group better going into the workshop, they also felt more empathy for that group (moderate correlation: .314). The same was true for the relationship between understanding and empathy on the 3-month post-survey (strong correlation: .660). In sum, we might argue that the more knowledge one has, the more one feels they understand someone, and the more positively they view someone, the more empathy they will feel for that person. In addition, Askers’ post-survey impressions of the groups were strongly correlated with both their understanding of the group (strong correlation: .642) and their level of surprise concerning what they learned (strong correlation: .522). In other words, the better someone understands an Answerer, and the more surprised they were by what they learned, the more positive their impression of that group. Related, surprise was also correlated with understanding (strong correlation: .627), possibly meaning that the more surprised the Askers were, the more they felt like they understood the group. We tend to pay more attention to things we are surprised by. It therefore might make sense that Askers paid more attention to these surprising moments, learned more from them, and therefore felt that they understood their group better as a result. The lower the reported “current view” of the group, the more nervous Askers were going into the workshop (moderate correlation: -.299). 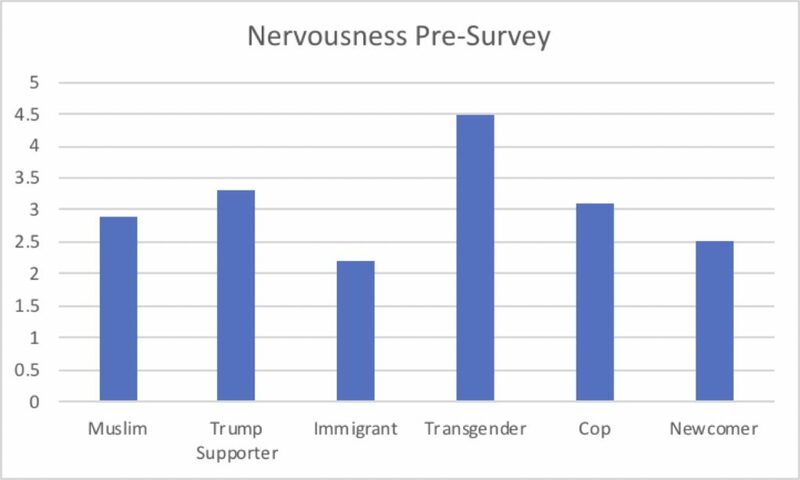 This might be telling us that participants are more nervous to talk with groups that they feel more negatively towards. Overall, this data is telling us that the workshops do indeed make a difference on the variables we are measuring; and these results last, as indicated by the 3-month follow-up. This seems to be the case no matter which group we look at. 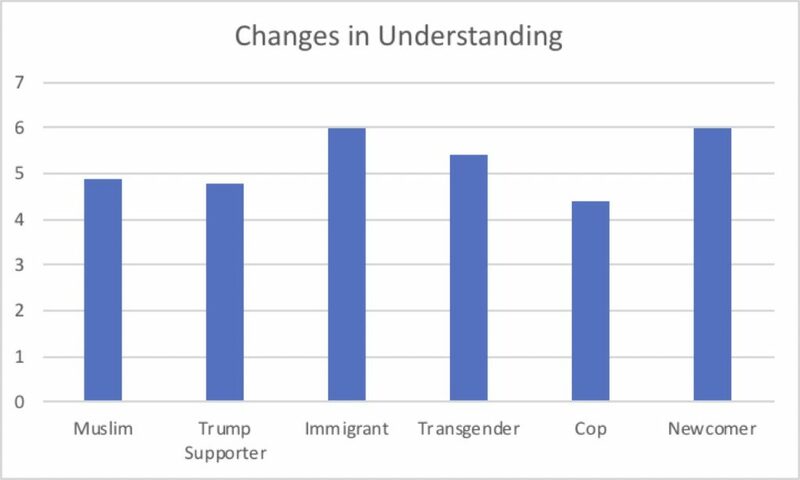 On the whole, the Askers felt most disinclined towards the Transgender and Trump Supporter groups, which highlights the importance of the positive changes with respect to those groups in particular. It’s important to emphasize (referencing our correlational data) that participants showed up in very different places with respect to these different groups, and those places mattered for other thoughts and feelings that they had, with respect to these groups. In other words, knowledge of a group or current view of that group is going to have an impact on empathy or nervousness. But once the Askers engaged in dialogue with their respective groups, they all had more positive views and these views lasted over three months.